Black mold is a type of fungus that thrives in damp, dark environments. Because black mold humidity, this fungus is common in areas of the home that is moist and warm, like the bathroom. Unlike other types of molds, black mold is readily identifiable by its color. There are two types of black mold: common black mold and Stachybotrys black mold. Common black mold grows in damp, isolated areas of the home while Stachybotrys black mold grows on surfaces made with cellulose. 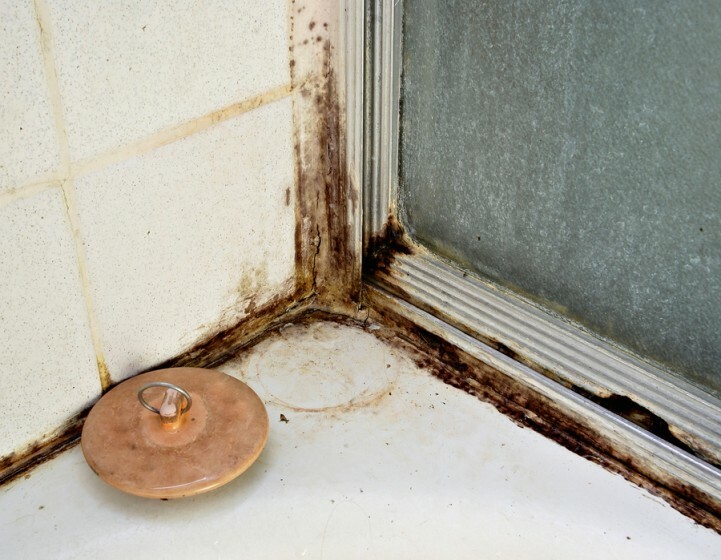 Causes of bathroom mold range from lingering moisture caused by poor ventilation, plumbing leaks, and damp cellulose. Unfortunately, any type of mold can cause a wide array of discomforts and health problems. Black mold can cause respiratory issues, allergies, headaches, and chronic fatigue. These fungi irritate the mucous lining, causing sneezing, rashes, chronic cough, and sore throat. Prolonged exposure to black mold could cause bleeding in the lungs, mental issues, and weak immune system. Bleach is one of the most effective cleaning products to get rid of all types of mold and mildew. The chemical kills fungus and bacteria on non-porous materials including bathroom sink, tub, and tiles. However, we don’t recommend using bleach for very colorful tiles or patterned surfaces. The bleach is likely to damage the print or tile color. To clean your bathroom using bleach, mix 1 part high-quality bleach with 4 cups of water. Pour a small amount of the liquid on specific areas of the bathroom and let it sit for 10 minutes before rinsing and scrubbing the area clean. Hydrogen peroxide is an excellent non-toxic black mold remover. Because the solution is not as abrasive, it won’t fade tile color nor affect the surface of the treated area. Hydrogen peroxide works best on porous materials. To use hydrogen peroxide to remove black mold, pour 3% concentration hydrogen peroxide into a spray bottle. Spritz the solution over the treated area. Let the solution sit for 10 minutes before scrubbing the area clean. Ammonia works just like bleach. It eliminates bathroom mold, kills fungus, and prevents them from coming back. However, this chemical generates noxious fumes so make sure you are wearing protective gears when using ammonia. To eliminate black mold using ammonia, mix one part ammonia and one part water in a spray bottle. Spray the solution on the treated area and let the ammonia sit for 10 minutes. Scrub the treated area with a small brush and wipe clean. Repeat if needed. Borax is a gentle black mold remover. It is not as harsh as ammonia and bleach. We recommend using borax sparingly so follow the label when using this product to eliminate black mold. Just mix a cup of borax with one gallon of water. Mix well and pour a small amount on the treated area. Let the solution sit for 10 minutes before scrubbing the black mold clean. Rinse with water and repeat if needed.